The symbol of change in quality. A historical symbol elevated into fashion. The Kappa Kane merged with fashion. Fashion-forward with the New Greek. 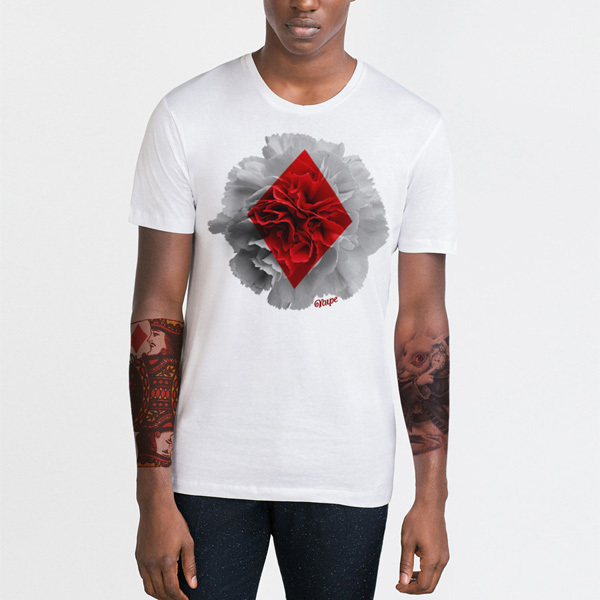 The NALIA Nupe 2016 Diamond Bloom Collection is be inspired by the red carnation and harlequin diamond. The beauty in the bloom of a red carnation combined with the precision and cleanness of a harlequin diamond results in the creation of a innovative fashion collection. Unifying the meaning and beauty of each element personifies the essence of artistic evolution expressed through fashion. We are pushing the envelope with design in contrast to the typical Greek letter apparel. With the Diamond Bloom collection we hope to open the eyes of all members of Kappa Alpha Psi Fraternity to see the future of luxury Greek apparel. We are working a design collection for Iota Phi Theta Fraternity that fuses history and Greek methology with innovative designs. No more wearing the standard Greek apparel. Now you can wear your history without wearing your letters. The product shown is called "Chirons Aim". It is scheduled for release late Fall 2015. Register today for updates on full collection launch. Progress is never accepted by a opposing force even if progress benefits them as well. During the state of the union speech POTUS displayed the characteristics of a true leader and showcased how proud he was of the accomplishment of government to bring the economy back from near death. Unfortunately, the Republican party didnt attend the SOTU to celebrate the progress of the country, instead they showcase complete disrespect for POTUS. The combination of intentional ingnorance and disrespect only results in embarrassment from he realization of your failures. President Barack Obama mentioned that he had no more elections to run for and the Republicans responded with cheer admitting their relief that POTUS would be out of office soon. Barack responded by saying " I know because I won both of them"! Boo Yao! In your face Republicans! Not only is that a fact, but POTUS has a high approval rating with the country, and in the conclusion of his final year, he will be remembered down in history has the president who brought the economy back, and change the way how elections are won. If you want to get things done and change the world,.bet on black! To commemorate the birthday of Dr. Martin Luther King, Jr.; NALIA is creating a designer fleece, sweatshirt. The image used of DMLK personifies his vision and keen direction for the future. One with such a profound vision of the future for the equality of all people must always be honored in style. This item is made to order. For more information on how to pre-order this item email us at info@naliainc.com. You must be a registered member with NALIA before you can make a purchase. PLEDGE NALIA today and save! Happy founders day to the women of Zeta Phi Beta Sorority, Incorporated. We honor dedication, support, and continued pursuit to help build better communities. Happy 95th Founders Day! Pledge NALIA today to see more upcoming designs for the ladies in blue! Happy founders day to the prestigious ladies of Alpha Kappa Alpha Sorority, Incorporated. Congratulations on 107 years of promoting scholarship, unity among all women, and for being of valuable service for all mankind! Pledge NALIA today to see more of the Spring 2015 Ivy Collection. THE YHARD is the leading online destination for Greek letter organization contemporary fashion, interior design, art, news, and current events. Shop at our store and enjoy the best in daily editorial content.